Tibet Airlines is planning to open a new twice-weekly route connecting Jinan with Helsinki starting on April 8, 2019.
company Tibet Airlines commences flights from Jinan, China, to Finland on April 8, 2019. Tibet Airlines’ new route gives Finnish travellers access to yet another Chinese city, Jinan, and also brings both Finland and the rest of Europe closer to China. In terms of the number of flight connections, Helsinki Airport is clearly the leading airport in all of Northern Europe. Next summer, 44 weekly flights for China alone will depart from Helsinki Airport. In 2018, 835000 passengers traveled between Finland and China, and therefore the role of the new route is highly important for both Finland and Finavia. It is currently planned that flights on the new route will commence on April 8th, and they will be operated with Airbus A330 wide-bodied aircraft twice a week on Mondays and Thursdays. Flights to Jinan will be available both in business and economy class. With approximately seven million residents, Jinan is the capital of the Shandong province, located along the Yellow River in China. Tibet Airlines is the first Chinese airline company to commence flights to Finland. To establish the Jinan route, Finavia has collaborated with the City of Vantaa trade and business services and Visit Finland. Flight connections to China are the highlight of the summer 2019 at Helsinki Airport: Jinan, Beijing, Shanghai, Xi’an, Chongqing, Guangzhou, Nanjing, Hong Kong. In December 2018, Finavia’s Helsinki Airport hit its all-time record in terms of passenger numbers: 20 million passengers. Passenger numbers at Helsinki Airport have increased dramatically. In 2017, it was estimated that the threshold of 20 million annual passengers would not be broken until 2020. In 2018, the number of passengers was nearly 21 million. 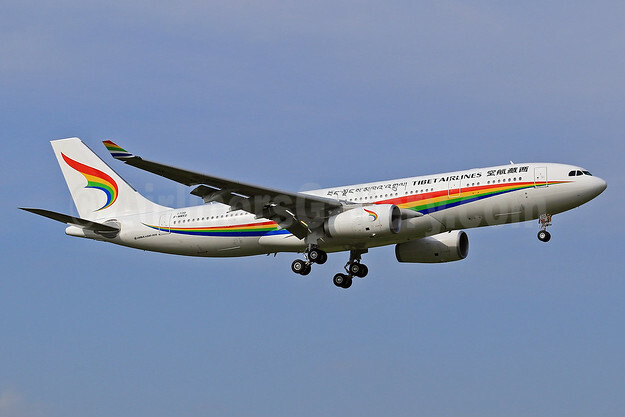 Top Copyright Photo (all others by the airline): Tibet Airlines Airbus A330-243 F-WWKU (B-8420) (msn 1730) TLS (Eurospot). Image: 933086. This entry was posted in Tibet Airlines and tagged Airbus A330-243, B-8420, F-WWKU, Helsinki, msn 1730, Tibet Airlines on January 9, 2019 by Bruce Drum. Tibet Airlines (Lhasa) has received its first widebody aircraft, an Airbus A330-200 with increased 242 ton maximum take-off-weight (MTOW), following a handover in Toulouse, France on June 30, 2016. The increased MTOW, the first A330-200 in China, allows airlines to operate from the most demanding high altitude airports where takeoff performance, additional range and improved operating costs are key. The aircraft is configured in a three-class cabin layout (12 business, 32 premium economy, 235 economy) and deployed to open up new international routes. Tibet Airlines currently operates an all-Airbus fleet comprising of 14 A319s and 2 A320s. The airline is famous for its high-altitude operations with its operating base at Lhasa Airport which is at over 3,500 meters altitude. With the proven performance of Airbus narrow body, especially the A319 in high-altitude airports, Tibet Airlines has been successfully connecting Tibet with more domestic cities like Beijing and Shanghai. The A330 is the first widebody equipped with the Required Navigation Performance with Authorization Required (RNP-AR) and the only widebody airliner today flying over Tibet’s sky. It will exceed the airlines’ expectation on high-altitude performance also offer unrivalled efficiency, also greater comfort to the passengers. Copyright Photo: Tibet Airlines Airbus A330-243 F-WWKU (B-8420) (msn 1730) TLS (Eurospot). Image: 933086. This entry was posted in Tibet Airlines and tagged Airbus A330-243, B-8420, F-WWKU, msn 1730, Tibet Airlines, TLS on July 1, 2016 by Bruce Drum.